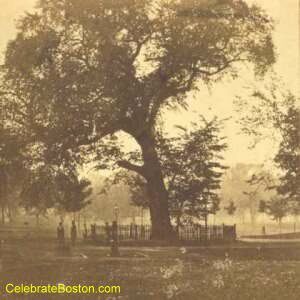 A Great Elm stood on Boston Common from Native American days until 1876, when it was destroyed by a huge gale. The Common was originally used as a cow pasture, with few trees standing within its boundaries for many years. The Great Elm was a popular tourist transaction in the 1800s, and was often referred to as Boston's Oldest Inhabitant. "THE GREAT ELM is one of the lions—perhaps the lion—of Boston Common. Still hale and strong, it stands about the centre of the green, and is supposed, to be upwards of two hundred years old. In 1825 it was sixty-five feet high, the circumference at thirty inches from the ground being twenty-one feet eight inches, and the spread of the branches eighty-six feet. In 1855 it was measured, and found to be seventy-two feet and a half feet high; height of the first branch to the ground, twenty-two and a half feet; girth four feet from the ground, seventeen feet; average diameter of the greatest span of branches, one hundred and one feet. This shows that the elm has grown considerably within the last quarter century. But this colossal plant has more interesting features than its age or size, though they are great. There was once a powder magazine near this tree, on the hill at which foot it stands. This hill, also, during the siege of Boston, was the site of a British fortification, bombarded by Washington. In the War of 1812 its existence was endangered by the encampment around it of American troops, destined to protect the town. It has often been exposed to injury by the custom of hanging and burning effigies upon its giant branches; and many turbulent occasions, on Election and Independence days, have exposed the tree to violence. Severe tempests have at times threatened to annihilate the tree; and in 1831 or 1832 a violent storm separated four of its large limbs, and so far detached them that they rested partially rested partially upon the ground. They were raised and bolted together; the bolts are still visible, and the branches, at the end of twenty-five years, appear to be perfectly united. For many years the interior of the trunk was rotten, and much of it had disappeared, from neglect; but finally the spirit of improvement, which came upon the Common, extended to the great tree, and the edges of the aperture were protected, and the exterior covered by canvas. The parts have been regenerated, and the opening filled and obliterated. THE OLD ELM. This tree has been standing here for an unknown period. It is believed to have existed before the settlement of Boston, being fully grown in 1722. Exhibited marks of old age in 1792, and was nearly destroyed by a storm in 1832. Protected by an iron fence in 1854. J. V. C. Smith, Mayor.